Ask about our LOW Interest Rate Bank and Credit Union Financing! We are an approved Agent for Local and National Lenders for all types of credit. Apply online now then pick up the phone and call us at 605-271-7355 (SELL). Please take the time to browse our inventory, where the selection is great and changes daily. Are you looking for the best place to consign your vehicle? We are your solution! NO CHECK IN FEE FOR CONSIGNING YOUR CAR, TRUCK, VAN, SUV OR MOTORCYCLE!!! You price it! We Sell It! Hassle Free! We provide financing and extended service contracts to your prospective buyer. Drop of your vehicle, pick up your check when it sells. It's that easy! This was by far the best car buying experience I have ever had. The description of the vehicle was right on. The van was super clean inside and out. The staff was very helpful and friendly. I would definitely buy from this dealer in the future! Demien, The Jeep arrived safe and sound this morning. It's a little nerve racking buying a vehicle sight unseen, even an old Jeep that is just gonna sit up north at an airport. But you description of the vehicle and its condition was very accurate. The Jeep is clean, straight and solid just as advertised, The truck driver commented that it was the nicest older Cherokee that he has ever seen. Thanks again for all of your help!! Great help and respect from the gentleman I worked with!! No pressure sale and he did everything in his power to make it a painless easy process. Give these guys a shot, they wont do you wrong! Just want to say thanks for the great customer service that my husband, James and I received from Rod when we bought a 2002 Chevrolet Silverado Z71 a couple months ago. We were so impressed that we sent our daughter Jessica there. She recently had a bad experience with a car dealership. She too received outstanding customer service from Randy. Randy made sure that she bought a car that she could afford, not just a car so he could sell her one. 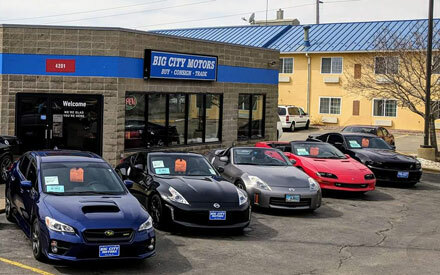 We will definitely be sending all of our friends and family to Big City Motors on 12th street whenever they are looking for a car!! Thanks again!! You guys are outstanding! !